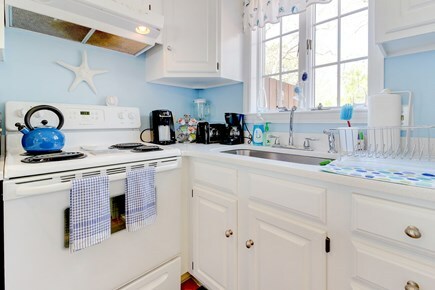 Escape to the perfect island getaway at this gorgeous, recently renovated Oak Bluffs home on lovely Martha's Vineyard. 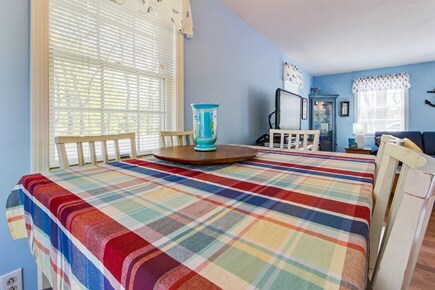 Light-filled bedrooms, a playroom, and a huge deck await! 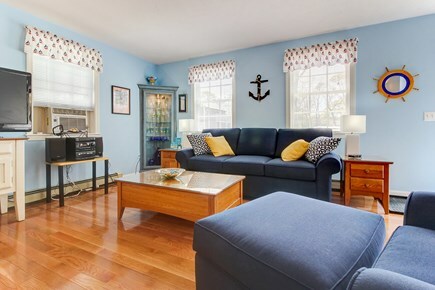 Downtown Oak Bluffs is nearby and it's only one mile to the water. If you'd rather remain on the property, you're surrounded by gorgeous trees and tons of space. 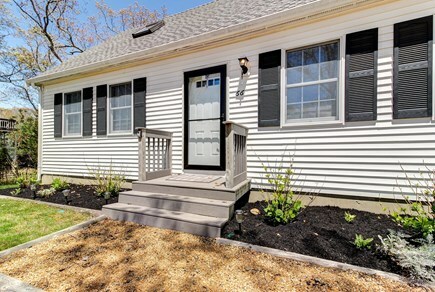 Fresh off of a renovation, this home has been updated with brand new hardwood floors throughout. 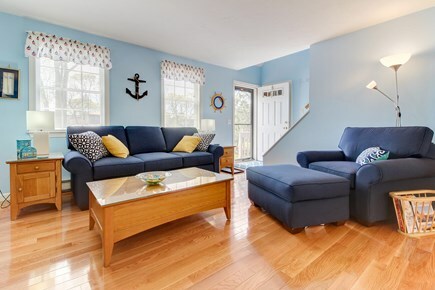 The living room features blue and white couches, a flatscreen TV, and a rocking chair. Dance to your favorite CD on the stereo system or grab a movie from the extensive DVD library. The dining area offers a six-seat dining table for formal dinners. 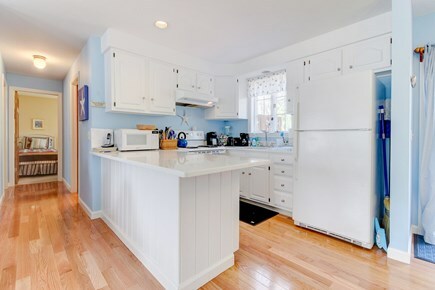 The newly updated kitchen features all the accoutrements one would need including a dishwasher, fridge, and electric range. You can grill your catch on the back deck grill and enjoy it under the stars. You get four bedrooms on two levels. 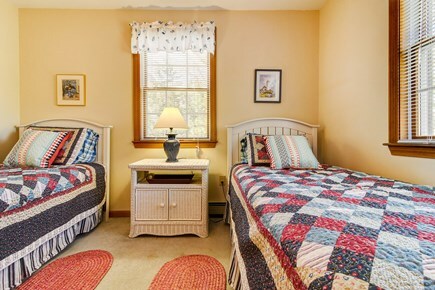 On the main floor, one has a queen bed and a comfortable armchair and the other has two twin beds and wicker furniture. The master bedroom is on the second floor with a four-poster queen bed, wood furniture, and a flatscreen TV under a skylight. 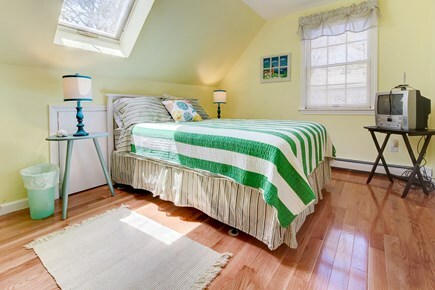 Upstairs, the fourth bedroom has a queen bed and skylights. 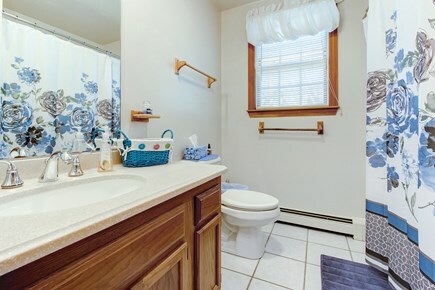 You also get two full baths, one on each floor. Head to the playroom in the basement for a competitive game of darts or air hockey or check your email via the free WiFi. There are a washer and dryer and two beach chairs, too. Martha's Vineyard boasts gorgeous beaches as well as quaint shops and beautiful preserves. Enjoy a view of Nantucket Sound from one of the lighthouses. It's especially memorable at sunset. 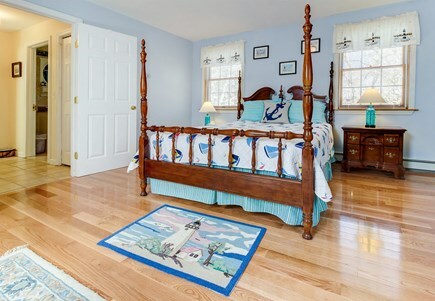 Relax and rejuvenate at this beautiful Martha's Vineyard home. Additional pricing info: For real-time pricing information, including the cleaning & booking fees, please contact Vacasa. State and local taxes of 11.7% will apply. This is a very cute house on a nice, quiet street. It is about a 1.5 mile walk into Oak Bluffs center. Although we did not have a car on island, taxis were easy to call and quick to respond. Nice deck with seating for 6. Nice bonus space in the basement. Plenty of room for 2 families or 6-8 adults. Will definitely stay again! Very cute and clean. This cute little home is perfect for a family vacation. 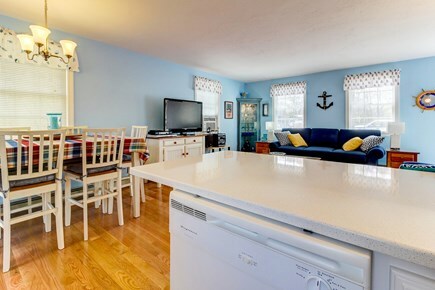 Amenities in the home are plentiful, including beach chairs, beach umbrella, boogie boards, and coolers for your beach outings. It's a little out of the way... In a quiet neighborhood about a mile from town. but the drives to Oak Bluffs and the beaches along Beach road are easy. 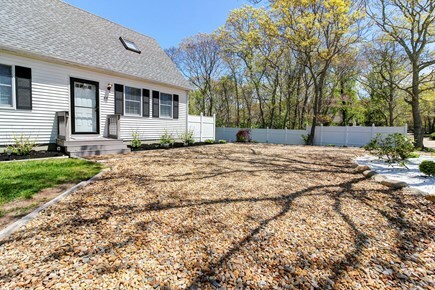 Lovely newer home tucked away in a quiet wooded neighborhood area close to everything by car. Would definitely rent this one again! Peacefull and relaxing. Near all shopping and sight seeing. Beaches r near. We enjoyed our stay at Cape on Forest. The setting was very quiet and peaceful and the deck was perfect for enjoying morning coffee and evenings grilling out. The home was comfortable and had everything we needed. The basement was a treat, and we all enjoyed darts, air hockey and even shooting hoops down there! It was a great get-away at a sweet home! 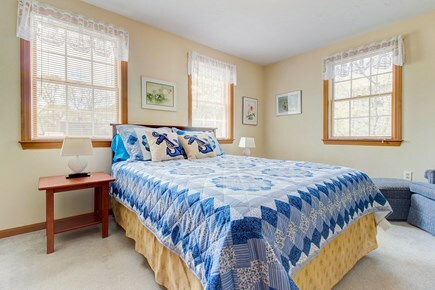 Great four bedroom house for the price of a hotel room in expensive Marthas Vineyard! Quiet surroundings, clean and well equipped house, would definitely go back. 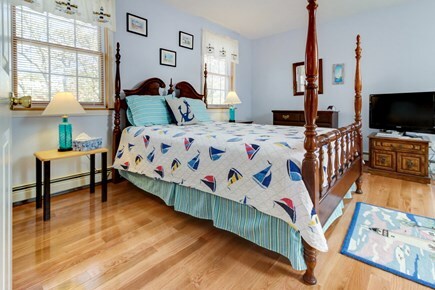 We really enjoyed our stay in this house in Oak Bluffs. The house was very clean and had a nice layout. There was a small yard with a deck and grill that were in great condition. The house itself was in good condition and was very comfortable for the 7 of us staying. The location is okay, but you definitely need a car as it is a couple miles to the beach and ferry. The neighborhood is nice and it is in a quiet spot. Overall, a very lovely stay and would definitely stay there again. We loved it! Peaceful, clean and spacious for our family of 4. Neighborhood is quiet and charming and made our stay on the island perfect!